There isn’t exactly a shortage of water-based fun on Cape Cod. With some of the world’s best beaches, vacationers flock to the popular Massachusetts destination for swimming, fishing, boating, and romantic walks among the seaside dunes, to name but a few of the area’s H2O activities. Those seeking some thrills to go along with the watery fun can often find decent waves for body and boogie-board surfing at the ocean-facing National Seashore beaches. 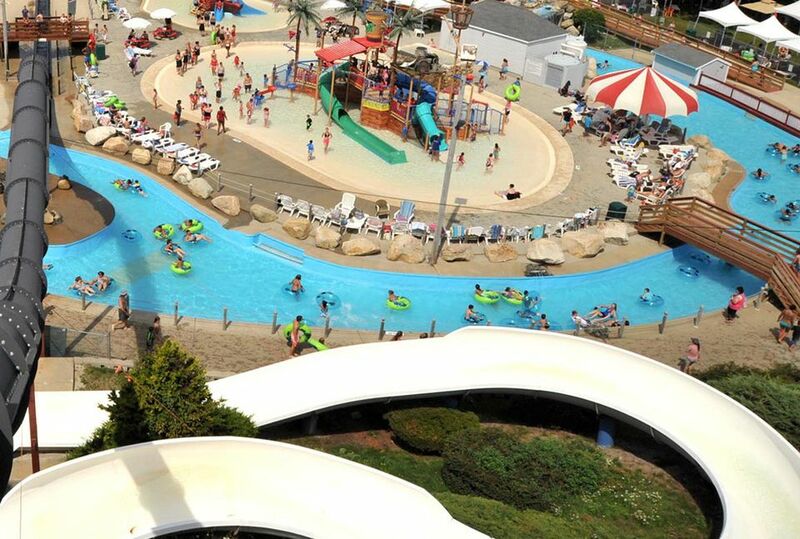 Officially known as Water Wizz of Cape Cod (the same company also operates a small water park in Rhode Island, Water Wizz at Misquamicut Beach), the park isn’t actually on Cape Cod. It is located a few miles on the other side of the Cape Cod Canal. It’s not particularly huge or loaded with the latest, greatest slides and attractions such as a water coaster, funnel ride, or half-pipe slide. But the medium-sized facility does offer many water park staples and would provide an enjoyable half-day excursion as part of a summer vacation. By the way, the park’s claim to fame is that it is featured in two major motion pictures. Perhaps the most thrilling attraction is Devil’s Peak, a pair of speed slides that rev riders up as they brave the drop. A second, smaller speed slide, Pirate’s Plunge, includes a partial lights-out descent inside a covered section of the tube. The Hurricane Hill water slide tower offers two less-daring straight-down slides as well as three twisting slides that all start at the 50+-foot level. Another tower, Squid Row (clever name! ), delivers two additional twisting slides, one of which is open and one of which is enclosed. The Canal tube slide tones down the thrills for a milder ride. Water Wizz offers five quick-serve dining locations. Among the items available are typical park food, such as hamburgers, chicken fingers, fries, and fried dough. More unique choices include wraps, steak and cheese subs, and grilled cheese sandwiches. For treats, the park offers Captain Cones, which serves hand-scooped ice cream, root beer floats, and ice cream novelties. At Salty Dawg’s, visitors can find cotton candy, popcorn, slush drinks and other sweet and savory items. Unlike many water parks, Water Wizz does allow guests to bring in their own food and drinks. (Note that no glass containers are permitted, however. And forget about alcohol as well.) Another nice way in which it is unlike other parks: Parking is free. Weather permitting, Water Wizz is open approximately from early June through Labor Day. Visit its Web site to confirm hours. The park offers discounts for children under 48" and seniors 65 and older. Also, it reduces prices for late afternoon arrivals. Visitors 2 and under are free. Group rates and season passes are available. The actual address is 3031 Cranberry Highway in East Wareham, Massachusetts. The park is located on Routes 6 and 28. From Hyannis (about 40 minutes by car) and other points on Cape Cod, take US-6W towards the Sagamore Bridge and Buzzards Bay. Continue to the Bourne Rotary and stay on US-6W and MA-28. The park is on the left. From Plymouth (about 35 minutes away by car) and points north, take MA-3S to Exit 1A, then US-6W towards Buzzards Bay. Continue to the Bourne Rotary and stay on US-6W and MA-28. The park is on the left. If you are looking for a larger water park in Massachusetts, the park that is included with admission to Six Flags New England in Agawam, Hurricane Harbor, is quite big and packed with rides. Another major New England park is Water Country in Portsmouth, New Hampshire, just over the Massachusetts border. Looking for Indoor Water Park Fun in Massachusetts? Six Flags, the Biggest Amusement Park in New England, Has Great Rides.